Whilst the Union of The Life Guards and The Blues and Royals precludes partisanship on the part of its members, it is nonetheless true that, although the finest pieces of 1st and 2nd Life Guards silver (the two pairs of Paul Storr silver kettledrums excepted) are dwarfed by The Blues’ Zetland Trophy, in the sphere of two-dimensional art, The Life Guards’ collection of paintings including works by Zoffany, Millais, Munnings and Maze, are in a different league to the collection belonging to their colleagues in the blue corner. Even the full-length portrait of Kaiser Wilhelm II, heroically portrayed in the uniform of the Royals, is a studio copy of the original, which is also ‘on loan’ to the Regiment by The Blues and Royals’ Colonel-in-Chief. It was with considerable excitement, therefore, that the Household Cavalry Museum learned in the Summer of 2017 that it was to be offered gratis by the Ministry of Defence a portrait by Sir Joshua Reynolds of the Marquess of Granby, Colonel of the Royal Horse Guards (The Blues) from 1758 to 1770. According to MOD records, this work of art had been given to the War Office in 1928 by John Manners, 9th Duke of Rutland, and was, with the shrinkage of space in the MOD Main Building, now surplus to the Ministry’s collection. So valuable was the picture thought to be that the Museum’s Director went so far as to consider requesting armed protection should she be required to collect it from MOD Main Building, just on the other side of Whitehall from the Museum, and one of the Museum’s Trustees raised concerns as to the likely impact on profitability of insuring the new acquisition. John Manners, Lieutenant General the Marquess of Granby (1721-1770), was the eldest son of John Manners, 3rd Duke of Rutland, and a soldier, politician and philanthropist. Today, the Eton and Trinity College, Cambridge-educated Marquess is best known because, thanks to his generosity in funding retired soldiers to set up as publicans, he is supposed to have the most number of public houses in the United Kingdom named after him, many of which display his bare-and-bald-headed image on their signs. 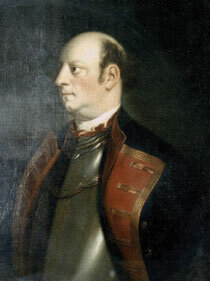 In the first half of his career, Granby was a very considerable military figure who is credited not only with leadership in the field of a high order, but to have been one of the first Generals to have recognised the importance of soldiers’ welfare and morale. 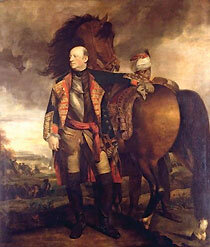 His immortality within the British Army, and his subsequent iconography, was ensured when, whilst leading a cavalry charge against the French at the Battle of Warburg in 1760, Granby lost his hat and wig, which obliged him later to salute the Allied Commander-in-Chief, Prince Ferdinand of Brunswick, without either accoutrement. In keeping with the finest traditions of the British Army, this act of lèse majesté was adopted by The Blues, and continued after 1969 by The Blues and Royals, whose Other Ranks are uniquely permitted, when in barracks and not wearing headgear, to salute officers bare-headed. Another highly unusual souvenir of Warburg was a portrait of the Marquess by Sir Joshua Reynolds, which was commissioned by the General’s principal opponent, the French Duc de Broglie, which is now in the Ringling Museum, Sarasota, USA. An artist’s copy of this painting, presented to The Prince of Wales (later King George IV) in 1810 by the Dowager Marchioness Townsend, hangs in the Waterloo Chamber at Windsor Castle. A Member of Parliament for the Manners family’s constituency of Grantham since 1741, the second half of Granby’s career, which dates from his retirement from field command after the Battle of Wilhelmsthal in 1762, was political although rather less distinguished. 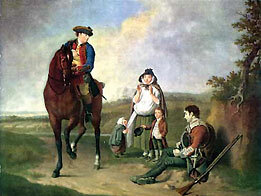 Nonetheless, Granby’s known charity to injured and retired soldiers, as immortalised by Edward Penny’s picture, The Marquess of Granby Relieving a Sick Soldier, made him a popular figure with the masses. This popularity was exploited, despite Granby’s avowed party-neutral stance, by the Whig Government when, in 1763, the Marquess was appointed Master General of the Ordnance, then (and until 1855) a position in the Cabinet and, the following year, with his additional appointment to the political post of Lord Lieutenant of Derbyshire. ‘The noblest mind that ever existed… [his] temper plunged him into difficulties, debts and distresses; [he had] a miserable shifting life, attended by a levee of duns, and at last die broken-hearted’. Pre-deceasing his father the 3rd Duke of Rutland by nine years, Granby never had ownership of Belvoir Castle and its magnificent collection of fine art, which had been added to greatly by the 3rd Duke, who liked small pictures which he bought at auction or through dealers, and was further enhanced by Granby’s son, the 4th Duke, a friend and patron of Sir Joshua Reynolds (1723-1792), who also acted as the Duke’s artistic adviser and procurement agent. Today, Reynolds is rather better known than his patron’s father, as his portraits have remained highly collectable since the day they were painted, despite being roundly condemned by the Pre-Raphaelites who nicknamed the artist ‘Sir Sloshua’ in relation to his style: ‘sloshy’, according to Millais’ Pre-Raphaelite colleague, Rossetti, meaning ‘anything lax or scamped in the process of painting... and hence... anything… of a commonplace or conventional kind’. Reynolds has, however, had the last laugh because, whilst the Pre-Raphaelites’ work is now prized only by art historians, collectors of Victoriana and the Household Cavalry Museum (thanks to its ownership of Millais’ The encounter between Shaw, the Lifeguardsman, and a French Cuirassier), Sir Sloshua’s works continue to attract premium prices in the auction rooms. Although nineteen of Reynolds’ paintings in the Rutlands’ collection were destroyed in a fire at Belvoir Castle in 1816, the artist is still well-represented there including full-length portraits of Granby, iconically bare-headed, and his wife, Lady Frances. So, the gift by the 9th Duke to the then War Office of a Reynolds portrait of Granby, which is the subject of this piece, means that it has an excellent provenance. Like his forebear, the Colonel of The Blues, the 9th Duke of Rutland (1886-1940), while still Marquess of Granby, served in the British Army. However, unlike his bald-headed ancestor, he was a Territorial soldier having, in 1910, taken a commission in the 4th Battalion of the Leicestershire Regiment, originally known as the Leicester Town Rifles, of which his father was Colonel. The future 9th Duke continued as a part-time soldier in the rank of Second Lieutenant until July 1914, when he sent in his papers. The outbreak of the First World War on 4th August caused Granby to withdraw his resignation, he re-joined the Colours and was promoted to Lieutenant. This determination to face the cannon’s roar worried his mother considerably for, following the death of his elder brother in 1894, Granby was the sole direct heir to the Dukedom. Whilst her son headed for the trenches, Duchess Violet pulled every string she could to keep him out of the front line. Thanks to her friendship with Field Marshal the Earl Kitchener, Secretary of State for War, and Field Marshal Sir John French, the Commander-in-Chief in France, she was successful - but it had a devastating effect on her son. According to Catherine Bailey in The Secret Rooms, her book about the 9th Duke, he ‘did all he could to fight with the men of the 4th Leicesters. But it was his mother’s meddling and constant undermining that finally got him returned home. He spent the rest of his life ashamed and his final years locked away trying to erase his past’. In 1925, Granby succeeded to the Dukedom but, probably because of his interest and expertise in Medieval art, instead of occupying as his principal residence the nineteenth-century Belvoir Castle, he restored the family’s ancestral pile in Derbyshire, the twelfth-century Haddon Hall. Quite why three years later the Duke, who had resigned his commission at the end of the war, decided in 1928 to give the War Office a valuable Reynolds from the Belvoir hoard is not recorded. A possible reason is that, in the opinion of the noted art dealer, expert in English portraiture and star of Fake or Fortune?, Philip Mould, this portrait of Granby is, at best, a late copy of a Reynold’s picture ‘in a private collection’ and so of very low value. However, what might have been disappointing news for the Household Cavalry Museum has now given its Trustees the last laugh. The reason for this is that on 15th November 2017, the Museum’s Director received an email from the Ministry of Defence informing her that, after further discussions internally, the MOD had decided to keep the picture in the office of the Chief of General Staff whilst transferring its ownership to the Government Art Collection. Could this decision have been to help offset the much-publicised fall of £490 billion in the value of the United Kingdom’s international investments? Whether or not that is the case, one can only hope that this portrait of the Marquis of Granby is entered on the Government’s balance sheet at its true value.